I spent the whole day with Nilo Nogueira explaining clearly the post apostolic season; the various challenges that the church in Brasil face; the changes that need to be made. Wonderful day in the Word. The evening saw my brothers Ralph and Louis arrive from South Africa. There was great joy as we shared on what the Lord has been doing here over the past week. 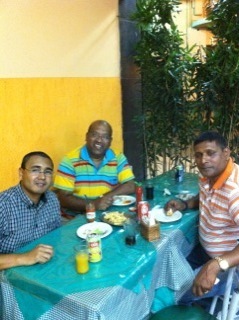 We are thankful to Anderson and Ana Paula for fetching the brothers from the airport. Tomorrow is a day of rest. We go on a tour to the island of Buzios, which is situated about 200km north of Rio de Janeiro. This is an important break as the work starts in earrnest from Thursday. We send our love to all our families and friends.